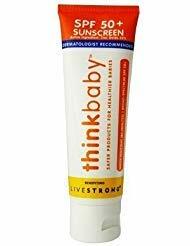 ThinkBaby Sunscreen scored high marks in all categories and is our top pick. This sunscreen for babies provides SPF 50 protection against UVA an UVB rays and contains no petroleum, parabens, PABA, Phthalates and other harsh chemicals. None of the children had adverse skin reactions to the lotion, even the young ones. The water resistant formula contains Zinc Oxide and is the first baby sunscreen to pass Whole Foods Premium Care Requirements. We spent over 20 hours researching and testing 15 different types of baby sunscreen and found that ingredients, waterproof ability, and effective time of protection were most important. There are a lot of different baby sunscreen types on the market today. With so many different brands and types, a lot of people simply resort to guesswork when it comes to choosing one. Our reviews are designed to tell you about the special features that each of the three top rated baby sunscreens has. Baby sunscreen is very important for your baby or toddler to wear when they are out in the sunshine. It protects them from skin damage that can affect them later in life. Not all baby sunscreen is created equal. There are some brands that definitely work better than others. Learn what the differences are below and choose with confidence. Finding the right sunscreen for your baby can be a difficult thing with all the chemical based sunscreens on the market. Thinkbaby Sunscreen SPF 50 provides your baby with healthy UVA/UVB protection that contains no PABA, Parabens, Benzoate, Phthalates, Petroleum and other harsh chemicals that can cause skin irritation. This water resistant formula contains the active ingredient Zinc Oxide 20%. It is dermatologist recommended and is the first sunscreen to pass Whole Foods Premium Care Requirements. It applies easily and absorbs well. When used with other sun protection methods such as hats and clothing, it helps prevent harmful and painful sunburn. This non-oily baby sunscreen decreases the risks of skin cancer and early aging. You get 2 – 3 0z tubes that will be plenty of protection whether you are at the beach or the pool or just outside for an extended period of time. You will get up to 80 minutes of protection with this water resistant formula, but should reapply sooner than that if the baby or toddler is playing in water or sweating. No parent wants their baby to get sunburned. Babyganics Mineral based Baby Sunscreen provides SPF 50 and is a broad spectrum UVA/UVB protection. It is non-allergenic and tear free so it won’t burn their eyes during application or if it drips into their eyes while playing and sweating. This Pediatrician and Dermatologist tested baby sunscreen contains No PABA, phthalates, parabens, fragrances, nano-particles and is never tested on animals. Your baby’s skin will be nourished with the NeoNourish Seed Oil Blend that is 100% natural. 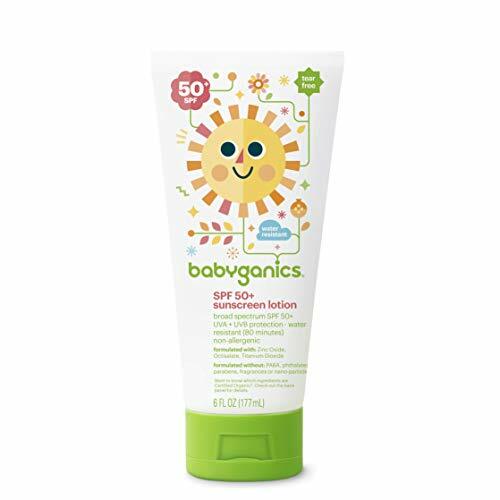 The Babyganics Mineral Based Baby Sunscreen is water resistant, allowing for up to 80 minutes of protection, although it is recommended to reapply often if the baby is outside sweating or playing in the water. If you are looking for a natural based, safe to use baby sunscreen for your baby, you won’t have to search anymore thanks to this Babyganics Mineral Based Sunscreen. It has everything you need to protect your baby from the harmful rays of the sun. You get two tubes of Babyganics Mineral Based Sunscreen. Now more than ever parents want to avoid harsh chemicals around their babies. Aveeno Baby Natural Protection Sunscreen offers parents the ability to protect their babies from the sun’s harmful UVA/UVB rays without the use of harmful chemicals. Their 100% naturally sourced sunscreen has soothing Oat and is fragrance free, making it perfect for sensitive baby skin. The broad spectrum SPF 50 sunscreen allows your baby to safely be in the sun and is sweat and water resistant. You will still need to reapply it if your baby is playing in the water to ensure the maximum amount of protection. It is pediatrician recommended as a means of sun protection for your little one. You get 3 – 3 ounce tubes of this excellent and effective natural sunscreen for a total of 9 ounces. If you’re going to have your baby out in the sun for any length of time, you want to protect their sensitive skin. Aveeno is a trusted name in sensitive skin care and this Baby Natural Protection Sunscreen is no exception. Protect your children from the sun without having to worry about the ingredients you are using and get Aveeno Baby Natural Protection Sunscreen for your next outing. With the all natural ingredients, you’ll get protection without worry of harsh chemicals that can irritate your baby’s sensitive, brand new skin. Whenever your child is outside in the sun you want to protect them from the damaging rays of the sun that can cause skin problems and premature aging later in life. These three top rated baby sunscreens give parents the ability to protect their babies without using harsh chemical ingredients that can cause skin rashes and irritation. Skin damage from the sun can occur very early so having the right sunscreen is important for long term and short term skin health. To learn more about choosing the safest baby sunscreen, read our buyer’s guide below. It will provide the necessary knowledge you need to choose the best and safest baby sunscreen for your baby or toddler. What is a Baby Sunscreen? Sunscreen has been a means of protecting people from the damaging rays of the sub for hundreds of years. Some of the first products used in sun protection included jasmine and olive oil. Now more than ever, parents are conscious of the ingredients in the baby products they use on their little ones and there are more choices than ever before. Sunscreen hit the commercial market in 1938 and has progressed since then to include many natural products that avoid the use of harsh ingredients that can cause skin problems for your baby. There are two basic types of sunscreens available, physical and chemical. Broad spectrum sunscreen is a combination of these two types. Despite popular belief, sunscreen should even be worn on cloudy days since 40% of the sun’s ultraviolet rays reach the earth even on a completely cloudy day. It’s possible to find the perfect baby sunscreen that will provide the necessary protection you want for your baby without the chemicals that can cause skin rashes and irritation. When you are choosing a baby sunscreen for your child, it is important to know the difference between sunblock and sunscreen. Many people think they are the same thing but this is not the case. They are made of different ingredients and provide different levels of protection for your child. Many lotions and consumer products contain sunscreen including moisturizers, make up and even aftershave lotions. Those are fine for people who don’t spend as lot of time outdoors, but if your baby or toddler is playing outside, you want a product that is specifically designed to protect them from the sun’s UVA/UVB rays. There are two basic types of sunscreens: Physical and Chemical and then there is Broad Spectrum sunscreen. We will explain the differences below. Physical Sunscreen - Another name for physical sunscreen is a sunblock. A physical sunscreen reflects the UVA/UVB rays, preventing them from penetrating the skin. They are not absorbed by the skin so they last longer than chemical sunscreen and are effective as soon as you apply it. Common ingredients in a physical sunscreen/sunblock include titanium dioxide and zinc oxide. If your baby seems to have an allergy to traditional, chemical sunscreens, a physical sunblock is a good alternative that will provide protection without any irritation. Parents can apply a physical sunscreen up to 3 times a day and they can be used on babies since they are gentle enough. Since they do not penetrate the skin, it is very rare that they will cause skin irritations or cause any allergies. Chemical Sunscreen - This type of sunscreen absorbs the sun’s harmful UV rays. Common ingredients in chemical sunscreens include avobenzone and benzophenone. Often times this type of sunscreen contains UVA and UVB absorbing chemicals that can cause skin rashes and irritations. Chemical sunscreens will penetrate the skin and they usually have multiple active ingredients that block a different region of the UV ray. Some chemical sunscreens also contain physical sunscreen/sunblock ingredients such as zinc oxide. Broad Spectrum Sunscreen - Broad spectrum sunscreen is a blend of both chemical and physical sunscreen and contains ingredients from both. They are typically the recommended sunscreen choice since they have the right ingredients to protect the baby from both UVA and UVB rays. Most of the sunscreens on the market today are broad spectrum sunscreens and will have a multitude of ingredients. Even the natural sunscreens are protecting babies from both types of UV rays so parents have more choices than ever when it comes to a sunscreen that will protect their baby’s skin. What to Look for in a Good Sunscreen? With all of the choices available nowadays, you may find choosing ONE a little overwhelming. Below we have outlined the features of a good baby sunscreen so you know what to look for when you start shopping. Ideally you want to look for a broad spectrum sunscreen that will protect your child from both the UVA and UVB rays. Below are some additional features to look for. SPF 15 or Higher – The SPF factor is what determines the effectiveness of the sunscreen in preventing the UVB rays from burning the skin. An SPF of 15 means that you can stay out in the sun approximately 15 times longer than without protection at all. An example of this is, if you can stay out in the sun 10 minutes without any sunscreen before burning, the SPF 15 sunscreen would allow you to stay out in the sun for 150 minutes, or 15 x 10 minutes. If you have extremely fair skin, it is better to reapply the sunscreen before the 150 minutes or you should get a higher SPF. For 6 months of age and older, an SPF of 30 or more is recommended. Water and Sweat Resistant – If you are exercising outdoors, playing in the pool or at the beach or otherwise sweating from the temperature, you want to make sure your sunscreen is still going to be working. Look for good, water and sweat resistant formula. Understand that water resistant does not mean waterproof. You will need to reapply the sunscreen after being in the water or if you are sweating a lot. Choosing the right sunscreen is important but you also need to make sure that you apply it correctly as well. We’ve provided some application tips for you to ensure the most protection for your baby. Apply the sunscreen to your baby or toddler about 15-30 minutes before you go outdoors. Make sure you put plenty of sunscreen on; this is not the time to skimp. Don’t forget to apply sunscreen to the baby’s head, back of the neck, tips of the ears, back of their legs, the feet and use SPF lip balm too. Burned lips are very easy to get and are extremely painful. Reapply every two hours maximum and if the baby is sweating a lot or playing in the water, reapply more often than that, especially after they come out of the water. Sunscreens expire and lose their effectiveness over time, so make sure to pay attention to the expiration date on your sunscreen. Apply sunscreen to your baby even on overcast days, especially at the beach or pool. The dangerous UV rays can penetrate the clouds just as easily. Also apply sunscreen during the winter if you are going to be outdoors. You can still get burned, even in the snow. Simply put, everyone over the age of 6 months should use sunscreen when they are outside. You should also wear sunscreen if you work next to windows that the sun comes streaming into. Windows, unless they are specially treated, do not block UV rays and you can get burned if you are in the rays at the window long enough. If your baby is under 6 months of age, most sunscreens are not recommended. However, a baby under 6 months of age should not be exposed to the sun’s rays at all. This doesn’t mean they can’t be outside, but it does mean that they should be under umbrellas, wearing hats, baby sunglasses, and in the shade as much as possible. Get your baby sunglasses. If they are introduced to it early enough they won’t fight wearing them. Don’t be outside when the UV radiation levels are at their highest which is roughly, 11 a.m. to 2 p.m. Wear a broad brimmed hat or sun bonnet. Thin cotton bonnets will not provide any protection for the baby as the UV rays can oftentimes go right through the fabric. Bring Beach umbrellas and set them up so you can get out of the sun often, especially when spending extended time at the beach or pool. Finding the right sunscreen for your baby is an important part of protecting them from harmful UV rays that can burn their skin in the short term and cause long term skin damage later in life. Taking the time to look at the ingredients in the sunscreens you are considering will help ensure that you get the right level of protection and the right combination of ingredients for your baby. There are sunscreens available for all types of skin and all types of situations, whether it is a baby with super sensitive skin or one that seems to never burn. Even if your child seems to have skin that tans easily, they still need a sunscreen to protect their skin from the damage that UV rays cause. Ensuring good sunscreen protection will enable your baby to enjoy being outside without having to suffer with painful sunburns later on.